I have two product reviews for you today-1 is good and the other is bad. Lets start with the bad one first. 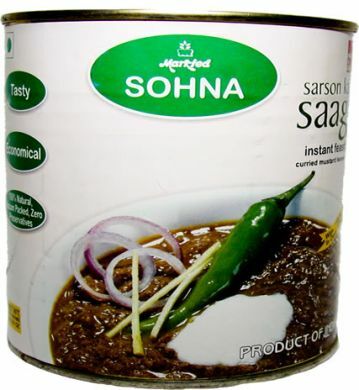 Sohna Sarson ka Saag- The packaging says- Tasty Economical ,Instant Treat – False on all counts. A typical Sarson ka Saag is scrumptions and smells divine,even before adding the dollops of butter,that is traditionally served with. It is a mixture of mustard greens and spinach leaves,slow cooked together with spices..This one smelled like boiled carrots..That should have warned me! The world wide web is full of recipes for this yummy treat and my own mother’s recipe is a keeper..then why did I chose to torture myself thus?Simply because,it takes a long time to cook..and I am the only one who eats it..I couldn’t justify the time and effort of cooking a big dish for 1. Mind you if it was for SD or one of the kids,I would do it in a heartbeat. Anyway,as far as Sohna Sarson Ka Saag is concerned,its AU$4 wasted.I have only three words for you:”Don’t bother trying” I am not one to waste food,but this one is definitely going in the bin! Someone suggested trying Deep’s frozen SKS..I don’t know if I want to subject my taste bud to this kind of torture again! !I am washing my mouth out with coffee,as I type this. 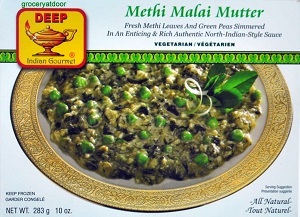 That brings me to the good part of this post.Deep’s Frozen Methi Malai Mutter.. This one is Amazing..I give it a 10/10 rating.I really felt like I was back in one of my favorite restaurants in Mumbai and eating this. I had it for dinner,one night,last week and couldn’t wait for it to be lunch time,next day..so I could finish the left-overs! Note:This is not a sponsored post..I take full responsibility for the views expressed here. Same here , I got a tin and when i actually ate it , it was different story .. had to cook something else to eat ..
as for the canned stuff..even thinking about it makes me want to throw up!